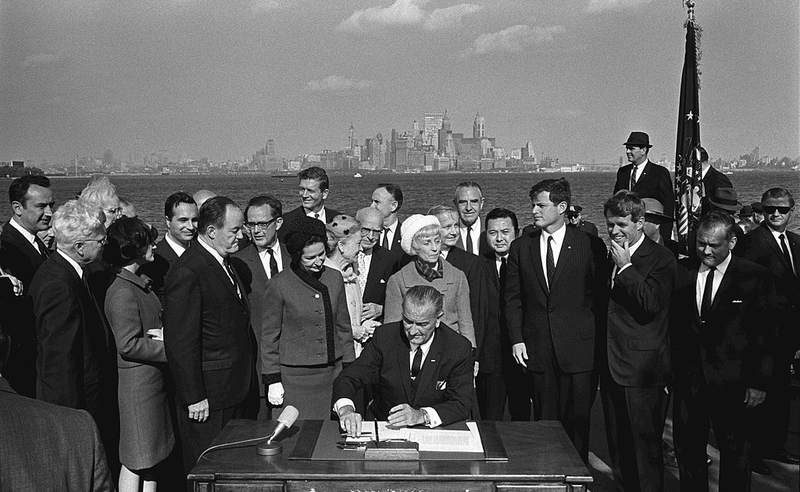 President Johnson signing the 1965 immigration act. Senator Ted Kennedy is standing over the President’s left shoulder and is looking to his right. His brother, Robert Kennedy, is to his left with his hand covering part of his face. On October 3, 1965 President Lyndon Johnson signed The Immigration and Naturalization Act of 1965, also known as the Hart-Celler Act. The bill ended national quotas restricting immigration that were signed into law in 1924. Before his assassination, President Kennedy had described the United States as a nation of immigrants, in fact, he was working on a book by that title at the time of his death. The book was released in 1964. Johnson took up immigration reform as part of his agenda, working with Senator Ted Kennedy, JFK’s younger brother, to build support for a bill. Below is an excerpt of the text that Johnson delivered on Liberty Island when he signed the bill. I have come here to thank personally each Member of the Congress who labored so long and so valiantly to make this occasion come true today, and to make this bill a reality. I cannot mention all their names, for it would take much too long, but my gratitude–and that of this Nation–belongs to the 89th Congress. In the final days of consideration, this bill had no more able champion than the present Attorney General, Nicholas Katzenbach, who, with New York’s own “Manny” Celler, and Senator Ted Kennedy of Massachusetts, and Congressman Feighan of Ohio, and Senator Mansfield and Senator Dirksen constituting the leadership of the Senate, and Senator Javits, helped to guide this bill to passage, along with the help of the Members sitting in front of me today. This is a simple test, and it is a fair test. Those who can contribute most to this country–to its growth, to its strength, to its spirit–will be the first that are admitted to this land. This system violated the basic principle of American democracy–the principle that values and rewards each man on the basis of his merit as a man. The land flourished because it was fed from so many sources–because it was nourished by so many cultures and traditions and peoples. And from this experience, almost unique in the history of nations, has come America’s attitude toward the rest of the world. We, because of what we are, feel safer and stronger in a world as varied as the people who make it up–a world where no country rules another and all countries can deal with the basic problems of human dignity and deal with those problems in their own way. Follow this link for a full text of the speech. To listen to Johnson deliver the speech, start the video below. How does Johnson describe his motivation for signing the legislation? What is the argument he is making? What impact does he suggest the bill will have? Research the impact of immigration in the United States since the bill was passed. What has changed? What about the immigration story has remained consistent from earlier periods of immigration? Compare what you find to the picture Johnson presented in his speech. Examine the image above. The location of the signing was chosen carefully to send a message. Also, look at the people who are surrounding the President. What do you notice?